With a large concentration of gaming companies and a booming manufacturing industry, is ‘Silicon Spa’ the right place for your business? Why start a business in Coventry? With a location in the heart of the West Midlands, nestled neatly between the clusters of advanced manufacturing and video games, aspiring business owners will find lots of compelling reasons to start a business in Coventry. The Coventry and Warwickshire Local Enterprise Partnership contains the third-largest concentration of gaming companies (after London and Dundee) in the UK, and is known locally as ‘Silicon Spa’. With the video game industry showing no signs of slowing its app-driven growth explosion, Coventry is a natural choice for a business in the sector. Along with other cities in the West Midlands, Coventry has an excellent pedigree in advanced manufacturing – especially aerospace – which is helping to drive the UK’s export resurgence. Coventry enjoys good transport links as a result of its proximity to the Birmingham conurbation. Birmingham International Airport can be reached in just 15 minutes’ drive, offering easy access to a number of international destinations, and you can drive to the centre of Birmingham itself in around half an hour. The capital is also easily reachable, with regular services to London Euston taking just over an hour in total. There is one university in the city itself, the comparatively new Coventry University (established in 1992). Despite being recently established, it has a solid reputation, and regularly places in the top 60 UK universities across multiple league tables. Just outside of Coventry lies the University of Warwick, a campus university containing a well-regarded business school. Warwick has a very good reputation, generally placing in the top 15 or so UK universities. Around 29.5% of the population have NVQ Level 4 qualifications or above – roughly equivalent to neighbouring Birmingham (32.6%) and Leicester (28.8%). The average weekly wage has risen significantly since of late, rising from £479 to £539. As noted above, Coventry is the third largest gaming cluster in the UK after London and Dundee and therefore many world-leading gaming companies are based in the area. If this is the industry you plan to start a business in, Coventry should offer excellent networking and collaboration opportunities at a lower cost than the capital. The University of Warwick operates a Science Park on its premises, which offers a range of attractive benefits for high-tech start-ups. These include a range of laboratory space, incubator facilities via Ignite, access to finance including the Minerva business angel network (run by the Science Park itself) and technical marketing support through the Techmark service. Similarly, Coventry University offers a Technology Park for knowledge-based start-ups, offering office space across a 20-acre site and dedicated guidance through the University. Support services include mentoring in business development, product development, growth, international expansion and more. Coventry is also the base of one of the Technology Strategy Board’s High Value Manufacturing Catapult Centres, a base that brings scientists, businesses and industry experts together to work on cutting-edge projects affecting the future of this lucrative industry. Unfortunately, there are no true accelerator programmes in the city at present – due in part to the government winding down its GrowthAccelerator service – and freelancers and sole traders also face somewhat of a dearth of co-working space. Again, though, Birmingham’s close proximity should see entrepreneurs and aspiring business owners able to access good support nearby. The Coventry and Warwickshire Chamber of Commerce offers “small grants” to local businesses to assist with the start-up process, a programme which is backed by the European Regional Development Fund. The Chamber of Commerce advises businesses to contact them for more information, as the amounts available depend heavily on criteria, location and other factors. Non-grant support is available through the Coventry Investment Fund (CIF), a £50m scheme which provides financial support to businesses looking to embark on major projects set to generate economic growth (mostly job creation) within the city. Qualifying projects will include the development of new commercial premises, and extensions to existing premises. Angel funding is available through Minerva, a Midlands network of investors with close links to the University of Warwick. Established in 1994, the collective typically provides investments of between £150,000 and £2m, alongside support with follow-on funding and general business mentoring. Coventry is solidly in the middle of the UK rankings when it comes to start-up survival and growth rates. 38.3% of firms started in 2010 survived through to 2015, a better survival rate than the larger cities of Birmingham (36%) and Manchester (35.9%)but about average for a city of its size. Whilst most of Coventry’s historic buildings were damaged or destroyed during heavy bombing in the 1940s, the city and surrounding areas are still richly steeped in tradition. The ruined Coventry Cathedral dominates the centre of Coventry itself, whilst nearby Warwick Castle is one of the best-preserved castles in England. The historic town of Stratford-upon-Avon is also nearby, home to the Royal Shakespeare Company and various other theatrical diversions, along with the picturesque town of Leamington Spa. Birmingham’s excellent nightlife is also a short drive away. All this means businesses choosing to locate in the region should have no end of entertainment to choose from. 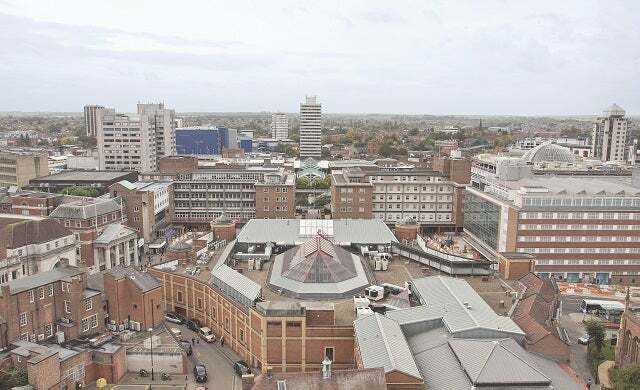 Coventry residents also benefit from a lower than average cost of living – the average house price in the city itself is just £167,510 – up from £120,000 last year. Crime rates are also considerably lower than the national average of 84.23, at just 62.85 crimes per 1,000 population. Dog walking start-up Wet Nose Waggy Tail advises on where to meet like-minded entrepreneurs in Coventry.